Founded by Phares Rutt in 1951, in Goodville, Pennsylvania, Rutt HandCrafted Cabinetry has set the standard for luxury custom cabinetry for more than 60 years and created a unique position as the manufacturer of high-end custom cabinetry. Rutt’s attention to detail, architecturally correct features, finishes and wood species has gained them a reputation as a design innovator and the Creator of Timeless Originals®. Rutt has always been known as the “master” of traditional design and is best known for their detailed, traditional custom cabinetry collections. Over the past several years Rutt has expanded their line to include some transitional and contemporary styles as well. In addition, they have added technology where it helps them to guarantee a higher level of quality, but never as a replacement for the pride and skill of their artisans. You will notice the quality in every aspect of their craftsmanship, from the harmonious way components join together, to the careful wood grain matching and hand finishing. Rutt HandCrafted Cabinetry also offers fully integrated LED lighting options for cabinet interiors that provide a clear view of the contents and mullion doors that feature true elite craftsmanship, with panes individually hand-fitted. As a single source for all of your architectural millwork needs Rutt can provide custom wainscot paneling, custom moldings; made to match your profile, custom turnings, interior passage doors and custom furniture pieces. Back in 2010, Rutt launched a product brand, named Rutt Regency that was designed to intrigue a broader clientele. 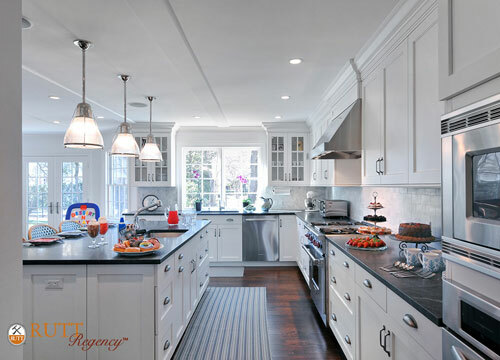 A full breadth product, Rutt Regency offers practically minded clients a cabinet solution comprised of superb quality, best-in-class finishes, standard features and customization that is uncanny at its price point. The expansion of the line was structured to offer design professionals an array of options in all realms, traditional, transitional, contemporary, framed and frameless at a wider range of price points. Rutt has been the foundation of thousands of unique kitchens over the years, and many are still enjoyed by their original owners. 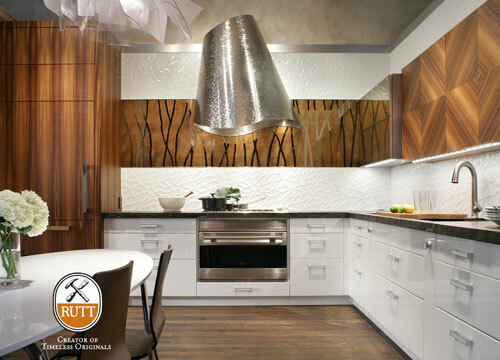 Appliances, flooring, and sinks have been replaced but the Rutt cabinetry remains—beautiful, functional, and timeless. All because someone had the vision to demand the very best.